[Koush] is at it again, this time releasing AirCast, an Android app that’ll push videos to the Chromecast from Dropbox, Google Drive, and your phone’s Gallery. Astute Hackaday readers will recall that AirCast has been around for a few weeks now, but limited to only his whitelisted Chromecast. As [Koush] explains it, he had to reverse engineer the protocols and now he simply avoids the Chromecast SDK entirely. If you’re lucky enough to have a Chromecast, you’ll want to hurry and grab the APK (direct download link) and have some fun with it before it self-destructs. [Koush] isn’t ready to release it for more than a 48 hour period, but we encourage you to take advantage of AirCast and contribute to his call for feedback, bugs, and crash reports. You have a little under a day left. See “AllCast” work its magic in the video below. No, that’s not a typo. Apparently [Koush] has been struggling with available names for the app, and you’ll hear him call it “AllCast” in the Youtube video. That name was taken for some other product, though, and “AirCast” has now replaced it. If you suddenly regret not immediately ordering a Chromecast and are sitting this one out, go read [Mike’s] rant and get psyched up for when they’re back in stock. Once the Google ADK was announced, the team over at [ElectFreaks] jumped right in and started experimenting to see what they could do with the new Arduino/Android interface. While the ADK was great for allowing the two devices to interact over a USB connection, they felt that the system would be far better if it allowed for wireless communications instead. They added a Bluetooth Bee to their Arduino setup and got busy writing an Android application that uses the handset’s built in Bluetooth module to communicate using the ADK. The application configures your phone to act as either a client or server when pairing. This does not affect data flow, as communications are bi-directional, it merely decides which device is placed in discoverable mode. 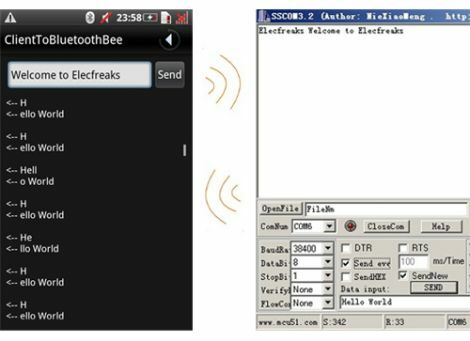 As you can see in the second part of their post, once the phone and Arduino are connected, it is quite easy to send serial data back and forth between the two devices. As of right now, their Bluetooth API is in Beta, so things might still be a bit rough around the edges. They do encourage anyone to download and modify the code, which is freely available on their site.